And Essentially True is a novel about love, loss, and sacrifice. The book tells the stories of two generations of the Mrozek family, with chapters alternating between the grandparents' experience during WWII and the years immediately thereafter, and their granddaughter's life in mid-1990s Krakow. First-time author Brigid Pasulka skillfully compares and contrasts life in Poland during these two very different eras in the nation's history, painting a vivid image of both its past and its present. The episodes that concern Pigeon and Anielica ("Angel") have an almost fairy-tale feel to them, in spite of the increasingly serious subject matter. The time frame feels distant and slightly unreal, with Pigeon in particular being a larger-than-life figure, always in control and capable of overcoming any obstacle. The narrator of these sections tells their story with warmth and humor. Which brings up the theory of the twenty-seventh resident of Half-Village, that the Pigeon was not after Anielica's attentions at all, but Wladyslaw Jagiello's [Anielica's brother], and at that he had succeeded from the very first day. It was a bold position to take because everyone knows that Poland did not have air-conditioning, homeless people, good Mexican food, or homosexuals until after the communists left. The parts of the book set in the latter half of the 20th century are narrated by Beata, Pigeon and Anielica's granddaughter. Her first person account depicts a woman whose life is more or less on hold. While her circumstances are less dire than those of her grandparents, her story is darker and lacks the joie de vivre evident in her grandparents' lives. Gone is the storybook atmosphere, replaced by a mundane day-to-day existence. These sections offer a counterpoint to those that center on Beata's grandparents, helping to balance the folk tale with reality and preventing either style from overpowering the novel. Pasulka does a wonderful job forming her characters; they're at once familiar and unique. Readers will feel they know someone exactly like each of the people described, and yet they do not slip into stereotype, instead they grow and change throughout the novel, which is one of the elements that makes this book so appealing. The only aspect that detracts somewhat is Pasulka's frequent use of Polish words, phrases and events without context. Sometimes readers will be able to get the gist of a sentence's meaning, but other times they'll be left in the dark. The intent may have been to provide a deeper sense of place, but for the most part it seems unnecessarily confusing; readers who find it annoying to pass over a word without understanding it might find it helpful to reference a Polish-English translation website from time to time. And Essentially True packs a huge emotional punch, particularly toward the end as the two story lines converge. Pasulka shows her skill in these delicate sections with narrative that is touching without being melodramatic. This is a novel that will likely appeal to a wide range of readers; and those who enjoy historical fiction, have a particular interest in Poland, or who simply take pleasure in top-notch writing will certainly want to put it high on their reading list. This review was originally published in October 2009, and has been updated for the May 2010 paperback release. Click here to go to this issue. Baba Yaga is a popular figure in Slavic folk tales (Slavic language map). Also known as the "Old Woman of Autumn," her origins can be traced back to the ancient Slavic goddesses of birth and death. The derivation of her name is not clear: "baba," is an abbreviated form of the word "babushka," the Slavic term for an old woman or grandmother; but the origins of "Yaga," are more muddy - possibly it is a corruption of "yagat" (to abuse or find fault), possibly it is from a Proto-Slavic word meaning lazybones, or it could simply be a diminutive of the Slavic name Jadwiga (a Polish variation of the German name Hedwig). A powerful witch, she's generally depicted as a hideous crone, with a long, warty nose, dirty, stringy hair, and steel teeth that make a fearsome noise when she gnashes them. Her mode of transport is a giant mortar, which she steers with a pestle in one hand, while in the other she carries a broom to sweep away her tracks. She is sometimes considered a source of wisdom, but more often the tales refer to her as someone who kidnaps and eats children. Baba Yaga's residence is a small hut on chicken's legs that dances around at will. It has no visible doors or windows. Anyone seeking to enter must say, "Turn your back to the forest and your front to me," at which point the hut rotates and lowers to allow entry. Baba Yaga herself frequently enters via the chimney. The hut is surrounded by a fence of human bones topped by skulls. 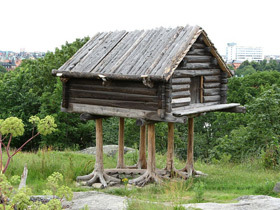 Interestingly, although the house on chicken legs sounds like the stuff of pure fantasy, it is possible that it is an interpretation of a type of construction popular among the nomadic hunters of Siberia which is designed to protect supplies from animals during long periods of absence. The doorless and windowless cabin is built on the stumps of two or more closely grown trees. As you can see from the illustration - the spreading roots of the trees do give the impression of chicken legs! Various servants appear in the tales. 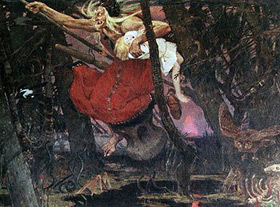 In many, Baba Yaga commands three horsemen: White (dawn), Red (noon) and Black (twilight). She's also said to have invisible servants who cook and clean for her, although in some stories her servants are various animals and inanimate objects. The most common Baba Yaga story concerns a young woman who is sent to Baba Yaga under false pretenses by her evil stepmother. In both instances, the witch gives the girl impossible tasks to complete, hoping that she'll fail and that she'll then be able to eat the girl for dinner. In one version, the girl consults a magical doll that her mother gave her on her deathbed, which helps her make prudent decisions and therefore survive the encounter (read a version of the story). In the other (which is believed to be a later Christianized version) the girl shows compassion for Baba Yaga's servants (giving ham to a cat, cheese to a mouse and breadcrumbs to a bird), which then reciprocate by helping her escape. (In some regions, this latter tale features two children  a boy and a girl  the precursor of the German fairy tale "Hansel and Gretel.") The stories are told to children to discourage them from straying too far from home. The first also encourages children to listen to their intuition, while the second promotes being kind to others.